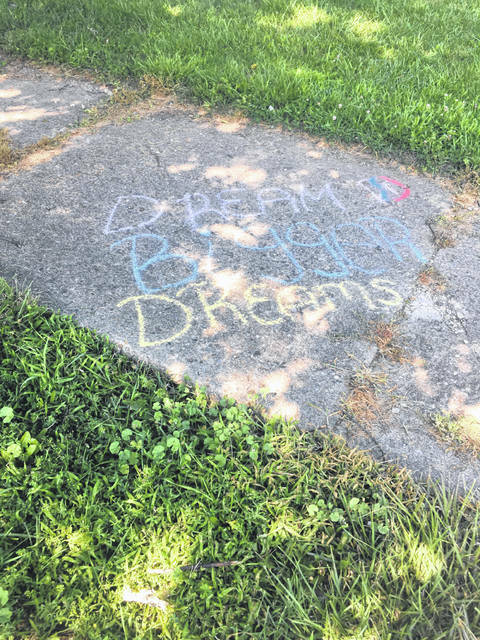 On the sidewalk in front of Patricia Brown’s house, her daughter, Anna Merriman, 17, has written “Dream Bigger Dreams.” The smiley face is an addition drawn by Chris Clark’s son. Patricia Brown and her daughter, Anna Merriman, pose beside artwork created by Clark. In Brown’s hand is a walking stick Clark carved by hand. Clark carved his handprint into the grip. Patricia Brown, 53, kept a watchful eye on her 4-year-old grandson as he laughed at a video he was watching on a smartphone. The boy is the youngest child of her son, Chris Clark, 34. Clark has three older daughters. All four children are being raised by their grandparents or great-grandparents. They are among nearly 3 million children in the United States who are being raised by grandparents, according to data from PEW research. Increasingly, the reason that grandparents are raising their grandchildren is that the children’s parents are addicts. It is her son’s addiction to heroin that has forced Brown to become a surrogate parent to his son, whose mother is also struggling with addiction, according to Brown. “I hear a lot of grandparents are raising their grandbabies these days,” she said. Clark began smoking marijuana and drinking alcohol as a teenager, according to Brown. Later, he began abusing pills. As often happens, his abuse of pills led him to heroin, which satisfies opioid cravings at a fraction of the price of pills. On Monday, July 2, Clark overdosed for the third time, Brown said. He is now at a treatment facility in Portsmouth. It’s not the first time he’s been to rehab, but Brown believes he is finally ready to commit to the hard work of recovery. The boy smiles a lot, which makes the dimples on his cheeks stand out. His favorite things seem to be the film “Charlie and the Chocolate Factory” and the song “Gangnam Style,” which he plays on repeat. He’s careful, though, to always be near his grandmother. When she steps outside, he immediately follows. “He has, I believe, separation anxiety,” said Brown. She said that every time she leaves for work he asks, “Nana, you’re coming back, right? He’s been left by the people that he loves the most and he’s just scared to death that grandma’s gonna leave him too,” said Brown. Brown is not going to leave her grandson, ever, she said. That means she’s committed to another 13 or 14 years as a guardian, just as she thought that phase of her life would soon end — her youngest is 17 and plans to join the military after graduation. It’s not the role she wanted to play in her grandchildren’s lives. “I want to be able to spoil my grandchildren, then send them home,” she said. She knows, however, that her grandson needs her. He spent 10 months in foster care in Alabama after his mother took him there and then lost custody, according to Brown. Clark had to go to court to bring him back to Washington Court House. Brown said she will do whatever it takes to keep him from going back into the system. “There’s nothin’ I wouldn’t do for my grandbabies,” she said. For Brown, that meant anxious days spent waiting for a message from Clark and, when days went by with no response, messaging everyone she could think of to ensure that he was okay. It also meant that she was always waiting for a phone call to tell her that he had overdosed. His addiction also caused him to quit working on his art, Brown said. “He’s really good with his hands, and its’s a shame to see that in his active addiction he was letting that go,” said Brown. Clark excelled at art in high school and has created everything from hand-carved walking sticks to beautiful, intricate tattoos. She is hopeful, however, that he will finally put drug use behind him. To do so, she said he’ll have to complete rehab and decide “that he truly wants to live.” Brown knows that completing treatment is just the first choice in a lifetime of choosing sobriety. “I’ve learned that it’s a lifelong journey,” she said. She hopes Clark will have the strength to continue to choose sobriety every day. She also knows that if he fails to do so, it could be fatal. She has seen families devastated by fatal overdoses, and she prays her family will not join these sad ranks. “No one wants to bury their children and it’s happening way too much,” she said. In contrast to those who make those types of comments, other members of the community have been supportive of Clark and his family. For example, Cody Bowen, who is organizing the CommUNITY event to raise awareness of the opioid epidemic, visited Clark in the hospital after his last overdose and helped to get him into treatment. Brown shares her son’s hope for the future. 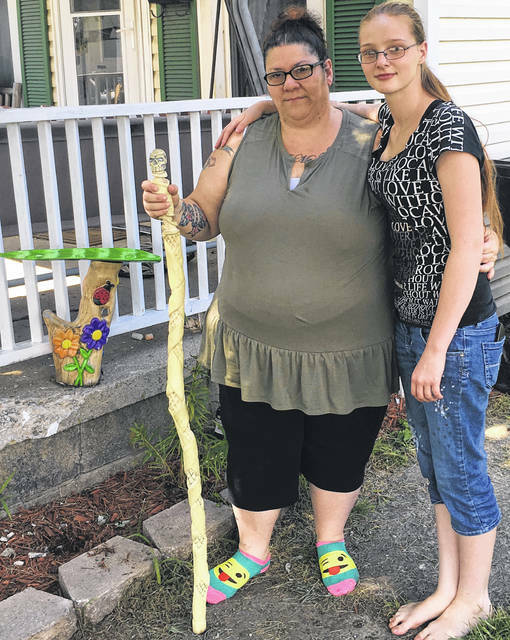 https://www.recordherald.com/wp-content/uploads/sites/27/2018/07/web1_dream-bigger.jpgOn the sidewalk in front of Patricia Brown’s house, her daughter, Anna Merriman, 17, has written “Dream Bigger Dreams.” The smiley face is an addition drawn by Chris Clark’s son. https://www.recordherald.com/wp-content/uploads/sites/27/2018/07/web1_patricia-brown.jpgPatricia Brown and her daughter, Anna Merriman, pose beside artwork created by Clark. In Brown’s hand is a walking stick Clark carved by hand. Clark carved his handprint into the grip.